"I could just make comics for the rest of my life. 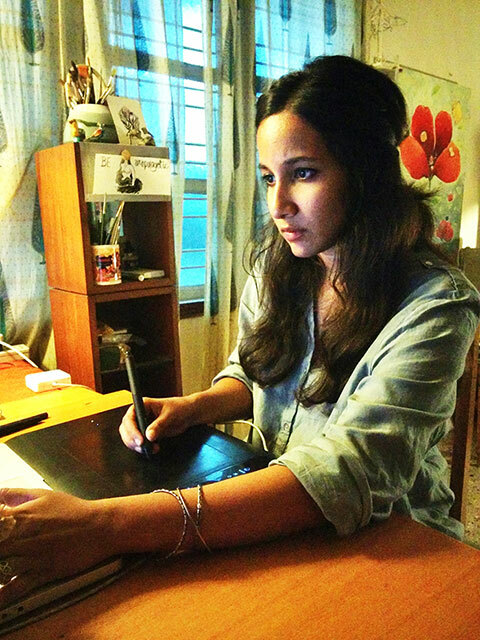 I would be really happy doing that," says Kaveri Gopalakrishnan, an illustrator and comics creator, who currently lives and works out of Bangalore. As a child, Kaveri wanted nothing more than to create and tell her own stories, and as she completed her gratuation at the National Institute of Design, she decided that she would rather work independently than pursue a full-time job. Not long after, she made the switch to becoming a full-time freelance illustrator, and has been involved with a number of interesting projects since then. Kaveri Gopalakrishnan. Photograph by Arun Kale. Did you grow up in Bangalore? No, I grew up in Chennai and Mysore. I lived in each of these places for eight years, and I spent the next six years in Ahmedabad, where I went to college. 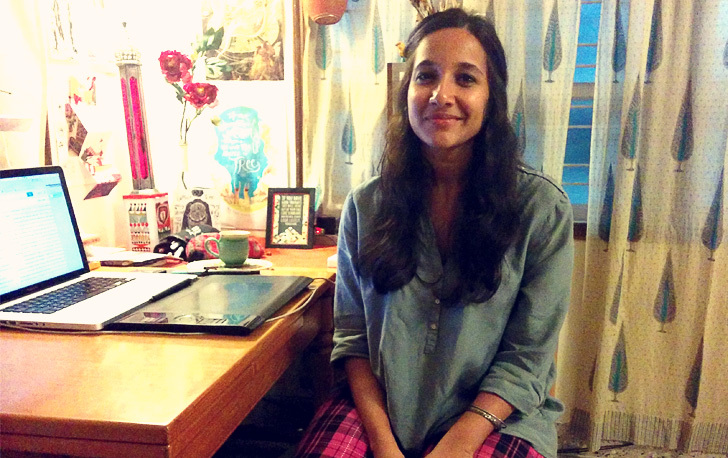 I’ve only been in Bangalore for the last two years — I moved here for my first job with Chumbak. What was the neighbourhood like where you grew up? Chennai was very chilled out. The school I went to was also very nice; it was a K-School. I spent my first eight years at The School (Chennai), and I ended up at the Valley School in Bangalore. That’s why I’m very familiar with Bangalore, and my friend circle is also from here. But Chennai was great, because I grew up near the sea (smiles). My school had a lot of greenery and we lived near the beach; we had a lot of art classes and other activities. It was very laidback. And I still like Chennai, but I think most people don’t, because it’s still the same, both in good ways and bad. Were you as happy in Mysore as well? The shift to Mysore was a really big one for me, because Mysore is a really small town. I was in third standard at the time, and I was there until my 10th. I went to pretty conservative schools there, and I think that it’s one reason why I wasn’t… well, I like the city, still — it’s very laid-back and quiet — but I can say that now, after having lived in other cities like Ahmedabad and Bangalore, which are noisier and more polluted. But growing up there was quite boring. I used to live on a farm, which again, I appreciate more now that I’m in my 20s; that there’s a place I can go to where there’s greenery and nature, and I don’t have any phone signal and I don’t have to meet people. But in terms of exposure while growing up, I didn’t have the Internet, and there were no good bookstores I could go to either. As a teenager, I remember I was really bored, and I wanted to get out and go to a city like Bangalore, just because there were things like plays and concerts. Bangalore is the cool city for people from Mysore. I think it’s like how people from old Pune see Bombay. "Bangalore is the cool city for people from Mysore. I think it's like how people from old Pune see Bombay." Were you creatively inclined as a child? Well, I never really formally trained in art back then, but we used to have these art sessions where there would be a lady at home and a bunch of us kids would sit and draw around her. My parents have referred to me as ‘the artist’ in the family from a very early age. I was sort of scatterbrained and dreamy, and that was always chalked up to me ‘being an artist’. I used to love writing and making up my own stories; I always thought I’d be like Enid Blyton or Roald Dahl, and that I would write my own stories and make my own illustrations. I grew up doing that, and I always thought I’d end up being an artist and do whatever artists did (smiles). Do you still have any of those stories with you? Uh… yeah, I recently found some. I used to make up stories about my cats, and the generations of cats that were always in and around my house. I used to write about their adventures, and we even used to dress them up. (Laughs) Yeah, the big dolls that my friends and I used to get on our birthdays came with Velcro dresses, and we used to take them off and put them on our cats. And the cats didn’t do anything to us, so we used to dress them up and make them act out elaborate scenes. Poor cats, I know, but it was a lot of fun (smiles). My friends and I also used to dress up ourselves when we were bored and pretend to be various Cartoon Network characters, like the Planeteers. (Smiles) Nice. Which one were you? I think everyone wanted to be the blonde one, but I used to always be the Asian one, Gi, the one with the water ring. I wanted the power of water, and wanted to create tidal waves and that sort of thing. 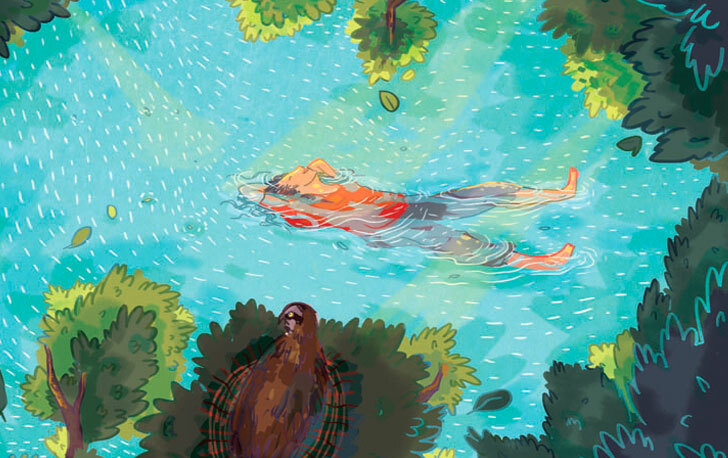 Editorial illustration by Kaveri Gopalakrishnan for the ‘Travel’ issue of UnMagazine by Campus Diaries (Dec. 2014). What made you decide to pursue a course at the National Institute of Design? After my 12th, I figured I’d either do art or design. If I did art, I would want to go to either Santiniketan or M.S.U. But I figured that art was something I could always do — it comes very naturally to me; to sit with materials and create things. I felt that studying design would be a smart decision, in that I’d learn new skills. And since I’ve always been quite a floaty person, I thought it’d be good to learn to be disciplined. I actually joined N.I.D. thinking I’d do space design, since I always liked restaurants and nice-looking spaces. The interview went great. I felt really confident afterwards, since I’d always just assumed that this was going to be my life path, and I think I was quite lucky to get in. I don’t know if I was being confident or cocky at the time (smiles), but this was what I wanted to do, and if I didn’t get into N.I.D., then I would apply at Srishti. But it was crazy when I got through; it was a major culture shock. There were people from all parts of the country. I’d never had a friend from the northeast or from Orissa, I’d never met anyone from Madhya Pradesh. Growing up in the south, you think that Bombay is north India, right? Anyone who speaks Hindi. (Smiles) Yeah, and everyone was joking in Hindi and talking in Hindi and the fact that everyone had their own private language came as a shock. That took a while for me to get used to, but it was also exciting. Most of my friends from N.I.D. ended up being from Delhi. And the thing is, everyone grows up together on campus. You stuff in 400 people in one campus and make them live and eat and sleep in the same space… it was good for those four or five years. Were your parents supportive of your decision to pursue design? Well, they saw me as doing art, and neither they nor I knew much about N.I.D. But they were supportive, by and large. I don’t know if they still totally get what I do, but yeah. The only thing they asked, as most parents do, is how I was going to make a career out of it. It was hard when I started working freelance, because even now they just think that I’m waiting for something better to come along. I take up larger contracts from M.N.C.s and my parents think that I’m going to eventually join those places. But I won’t, because I figured out in college itself that I would end up working independently. I’d work under someone else only if it was to get experience and understand things that I had no idea about. 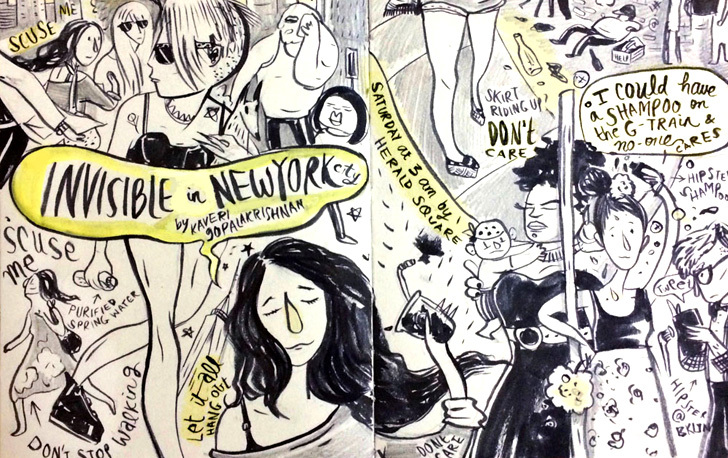 Autobiographical sketchbook illustration by Kaveri Gopalakrishnan, created using brush pens. What made you so sure that you wanted to work freelance? I attended this really great talk last year by this illustrator called Victo Ngai, and she said this one thing about freelance being a lifestyle. It’s not like a job; you have to change everything about your life. Little things like working on weekends… and when you have a lot of work, you have a lot of work, and when you have no work, you have no work. You can travel when you want to, but you have to be available on email all the time. Those are things that I’ve gotten used to now, and my family is slowly getting used to it. They think that I’m free a lot of the time; to do errands and come home, etc., but after the first six months, we both came to an understanding. "Growing up, I always thought I’d end up being an artist and do whatever artists did." What are some of your favourite memories from living in the N.I.D. campus? I spent most of my time at Chai Gate. It’s one of the front gates, and it’s mostly shut. It only opens when lorries or other large vehicles go through. There used to be guys who served chai through the gates and it was where everyone used to sit and drink chai and smoke and take breaks. It was nice because it was a little tucked away, and you’d always see the same people at Chai Gate through the years (smiles). There were the people who would eat at the student café, and then there were the people who’d sit at the gate and drink chai, or have one-rupee samosas. I used to sit there and draw a lot of the time, just because I felt that sometimes there was a little too much of us in each others’ faces, and it was nice to just sit there and do your thing. It was my favourite place on campus. You said that you’d initially considered studying space design. What made you take up animation film design? I’ve grown up watching cartoons and I love comics, generally, so I joined animation because it was the one course where you’d draw the most, and you’d constantly be watching a lot of animated videos. I didn’t know whether I would end up doing animation later in life, but at that point it made the most sense to me. 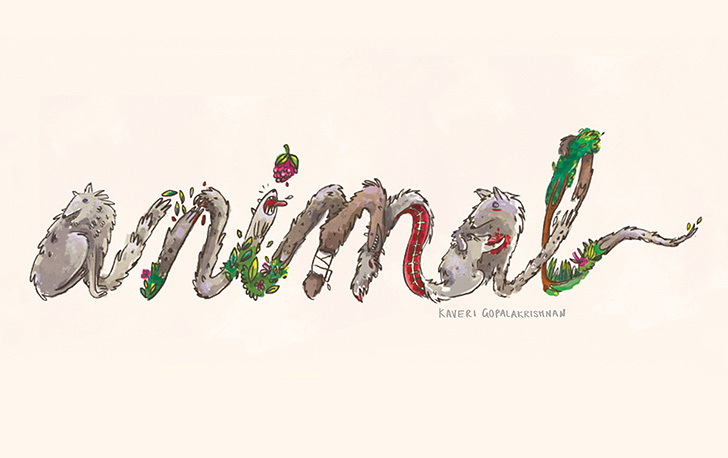 Typography by Kaveri Gopalakrishnan for the Animal Project: spirit animal of a wild wolf. After N.I.D., I interned in Bombay at an animation/ad house called Studio Eeksaurus. It was interesting doing production, but again, I figured it was something that I wouldn’t pursue later. My first full-time job was at Chumbak. I applied for the job along with a friend of mine, and we both joined together as their first in-house designers. I really wanted experience and I’d never worked with merchandise and products. Also, at the time, it was a small company working out of a small office, and we would work directly with our bosses. It was corporate, but not very corporate. It was a good experience. I mostly did design management there, not so much of illustration. But like with my internship, I realised that what I’d always wanted to do was to create my own characters, make stuff that I can look at and be like, yeah, that is 100% mine. That’s one of the reasons I started freelancing. I wanted to be able to choose my lifestyle; to choose what I do every day. Is your stint at Chumbak the only full-time job experience you’ve had? Yes. I worked there for a year, and even when I took on the job, it was with the intention of getting that first-job experience. I knew that it would be really stupid of me to jump straight into freelancing — I wasn’t very disciplined back then, and I felt like a silly college student who needed to learn a lot about the way things worked, and about what’s marketable. What if you make something that looks great to you and your friends, but no one’s buying it? Right? Anything we worked on at Chumbak had to be thoroughly researched. There were things like production costs and timelines that had to be considered — all the boring stuff about designing that no one likes to talk about (laughs). That’s gotten drilled into me. "I realised that what I'd always wanted to do was to create my own characters, make stuff that I can look at and be like, yeah, that is 100% mine." What is a typical day like for you? Are you an early riser? Do you follow any kind of routine? Yeah, I make sure I have a routine. In college, when I used to stay up all night, my health went for a toss. And generally, working without proper food and sleep is not something that works for me. I’m not a very early riser, but I make sure I wake up at 8 a.m., because that’s when the maid comes (laughs). She’s like my alarm clock. I like cooking. I make myself a big breakfast; I have my morning coffee. I take an hour or so to get settled, but when I start working, I don’t like to take breaks. I work till about 2 p.m., and my friends who live upstairs have a kitchen, so more cooking happens there. I have a designated space for working, and I make sure that I never work from my room or from my sofa — I always work at my table. Yeah, you need that physical distinction between your living space and work space. Yeah, yeah. After lunch, I usually work till about 6 p.m. If I have a project that demands it, I work after dinner, but I try not to. I don’t want to go to sleep after being on the laptop for so long. I go to yoga thrice a week, and I try to get out of the house as much as possible, but again, not during the day. 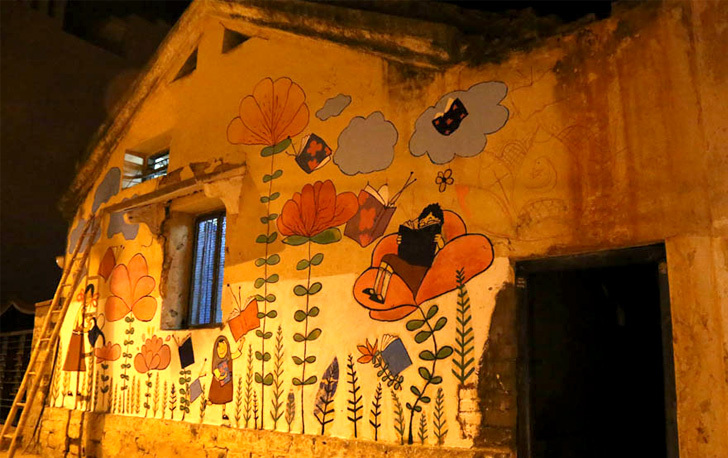 Wall art by Kaveri Gopalakrishnan in Shivajinagar, Bangalore, as part of a two­-day workshop and clean­-up campaign with high school girls (Fearless Collective). As a freelancer, do you find that clients want you to be available all the time? Do they call you at odd hours, expecting you to answer the phone? Yeah, that happens. It’s really inappropriate. How do you deal with stuff like this? Let’s talk about bad client experiences. (Laughs) I don’t like complaining about clients. I know it’s something that all of us do — we love complaining about our clients, and they love complaining about us. But the stuff you mentioned is something I find annoying because being a freelancer is not free. Just because I work at home doesn’t mean that I’m watching YouTube videos all day in my bedroom. I’m really not doing that. When I receive emails at 8 in the evening, it irritates me, because it’s not so late that I can’t reply. In the beginning I would respond to everything and made sure I worked day and night, but now I just make it clear (over email) that if I’m working overnight, I’m going to charge for it. Does that rub some people the wrong way? Yeah, I mean that is just insulting. Or they say stuff about getting exposure for your work, etc. When it comes to money, negotiating is just the hardest part of it. If someone’s bargaining too much, sometimes you get a feeling about whether they’re going to try to squeeze more work out of you. I think that’s one thing we do a lot of in India. "They say things like, 'You're a freelancer and our budget is for a freelancer.'" You attended a summer residency program at the School of Visual Arts in New York City earlier this year. How did that come about? When I was at N.I.D., I thought about doing my postgrad, like everyone does, and a lot of illustrators that I really like have studied at or teach at S.V.A. Also, I’d always wanted to go to New York. Later, I decided that I didn’t want to do a postgrad course at all, because I’d rather work than be a student again. A friend of mine had applied for the summer residency at S.V.A., and she told me to apply for it as well. I got through, and it worked out well. It all happened very suddenly; when I got through at S.V.A., I was doing another comics writing residency in Delhi as well. So it turned out to be an entire summer of residencies (smiles). What did you work on as part of the residency program? It was sort of a boot camp for illustrators. It was understood that you already had the skills, and they didn’t actually encourage you to explore anything new, but the idea was to be the best at what you do. At the end of it, I got a pretty clear idea about the kind of person I was, and the kind of work that I wanted to do. I realised that I could just make comics for the rest of my life, and I would be really happy doing that. I was excited to come back to India after that. Sleepless Comics by Kaveri Gopalakrishnan. Did you form the Sleepless Summer Collective during your time at S.V.A., or was it something that kicked off after you returned to India? We launched it when I came back to India, but we spoke about it a lot during the program as well. There were about 16 of us who were a part of the residency, and about 13 of us stuck with it. We talked about the project a lot, about continuing it even after the residency, because it’s a huge support system. Everyone is in their own countries now, and everyone has this idea that they want to make it at whatever they do. We decided to form an international collective, and the idea was that whatever we work on, there would always be someone awake. I started Sleepless Comics, which is a sister project of this, and again, it’s just an exercise to make sure that we keep making comics. Do you have any plans for the Collective, moving forward? We want to make it commercial, we want it to become bigger. If we keep making stuff together, I’m sure something will work out. As of right now, it’s pretty young. 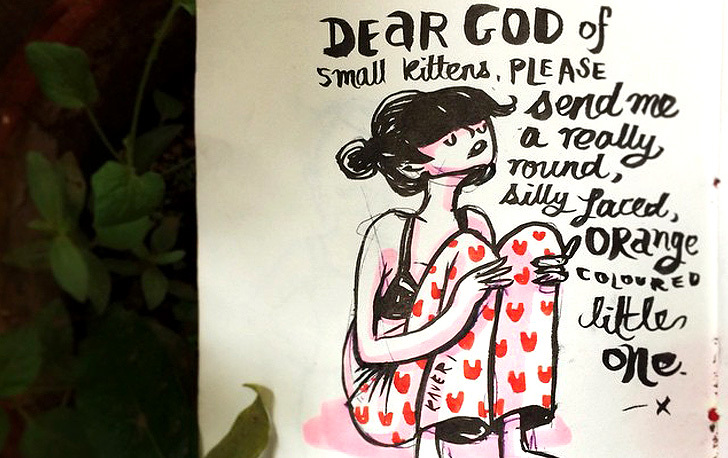 Are the other illustrators in the Collective freelancers as well? No, actually, I think it’s just me and another person who is a freelance children’s book illustrator. What comics-related projects are you currently taking on? Um, as far as client work goes, these days, I work with a children’s science magazine in Bangalore called Brainwave. They’ve always had really strong illustration work in the magazine. I’ve started doing a science comic for them every month, like a double spread, and the creative direction is completely up to me. I’m also working on a comic together with Aarthi Parthasarathy, who also creates the Royal Existentials webcomic. She and I have worked on a few scripts, and this one is about the Section 377 revoke, which is something I’m interested in. I’ve always wanted to do adult content in India, and humane stories. The comic I’m working on with Aarthi is something that’s very serious; it’s nonfiction, and about something that is actually happening in India. People from different generations are going to see it and maybe get a different perspective, or understand it better as something that impacts a certain part of the population. Yeah, the other thing I’m working on has to do with the workshop that I attended in Delhi earlier this year. It was organised by Zubaan Books and Max Mueller Bhavan, and it’s going to result in a by-women, for-women anthology. I’m excited because I think it’s going to be the first all-woman comics anthology to come out of India. It’s about drawing lines and boundaries, and about issues faced by women in India. It’s something that is close to my heart. 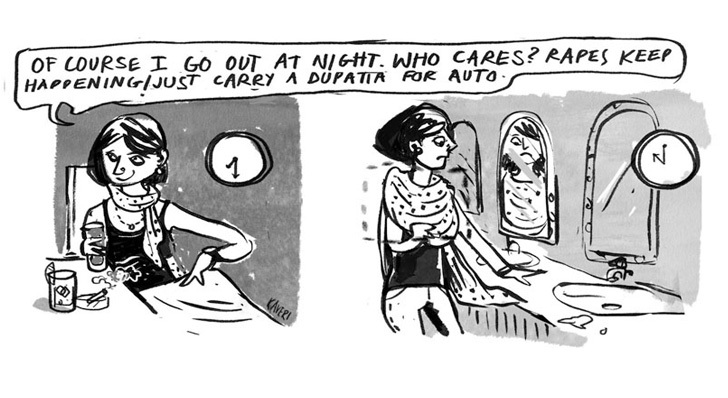 An excerpt from Basic Space, a series of comic dialogues on women in public spaces for Zubaan Books (upcoming). Do you have any plans to create your own graphic novels, something where you both write and create the illustrations? Currently, I’m focusing on completing the book that I’m working on with Aarthi, and getting it out there. Self-publishing is something that I’m just beginning to understand. It’s exciting, and there are other avenues out there, like Captain Bijli Comics, and the Pao Collective, Manta Ray Comics. In terms of my own stories, the ideas that I have are super visual, to the point where I feel that there’s no point in me writing anything; I might as well just do the art. I like incorporating the text as part of the visual, but not so much writing out the script and things like that. I’m not sure about writing very personal stories, though. I think it’s putting a lot of yourself out there, and maybe I’m not ready for that just yet. I’d like to create my own graphic novels someday, but over the next year, I’m just going to focus on getting as much of my work out there as possible, and create stories that I actually want to read myself.